Automotive « Global Market Insights, Inc. The global reed sensor market is lately witnessing an exponential growth rate, driven by the rapidly rising demand for advanced sensor technologies across industries such as military, aerospace, medical, security, transportation, smart grid & utilities and telecommunications. Attributing to a widespread application spectrum, the global reed sensor market was valued at over $1 billion according to a 2017 estimate. Reed sensors are basically devices made up of reed switches that incorporate a pair of flexible magnetic reeds and can be used in various applications ranging from flow and liquid level measurement to motion detection and sensing, proximity sensing and metal detection. One of the major factors behind the sensor’s rapidly growing demand is its robust and reliable nature and the low power consumption that allows for the device to be used in a plethora of battery operated applications. It is anticipated that the expansion of the smart home market in developed nations across the world would be further fueling the growth of the reed sensor market. Moreover, the incredible rate of production that the consumer electronics market is witnessing across developing nations would also be responsible for propelling global reed sensor market further. 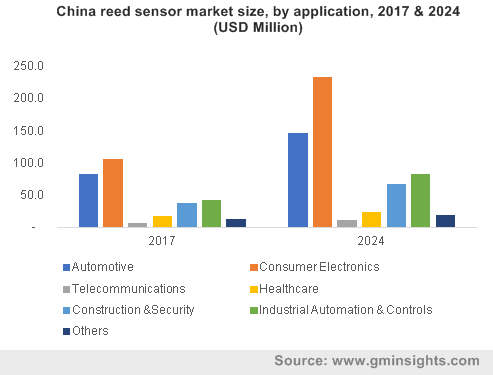 Home to nations such as China, India, Japan, South Korea and Taiwan – some of the world’s biggest consumers as well as manufacturers of automotive and consumer electronics, APAC presently holds the largest share in reed sensor market. According to a report by Standex Electronics, the device’s high demand is attributed to its availability in hundreds of different shapes and sizes and its ability to survive billions of operations without experiencing much wear and tear. The aforementioned features have made reed sensors the go-to solution for the established automotive and consumer electronics markets in the APAC region. Moreover, government initiatives that support and encourage the growth of these industries are also likely to augment reed sensor demand further. Additionally, demands for remote home monitoring systems from the smart home markets of South Korea, Japan and China is projected to be another major contributing factor that will impel the APAC reed sensor industry growth. Driven by a highly established manufacturing sector and robust industrialization trends, it is projected that APAC reed sensor market will grow at an impressive CAGR of 12.5% over 2018-2024 in terms of unit shipment. A significant contributor toward the global industry, the North America reed sensor market is primarily driven by the booming smart home industry as the sensors are witnessing wide-scale adoption across a plethora of connected home systems such as voice controlled temperature modulating systems and automated intrusion-detecting smart home systems. The regional market is also simultaneously receiving a considerable boost from the automotive industry as more and more automobile manufacturers are implementing the systems in their vehicles to facilitate a number of features like power windows, fuel and oil level measurement. The U.S. reed sensor market size, had been pegged at over $350 million according to a 2017 estimate. 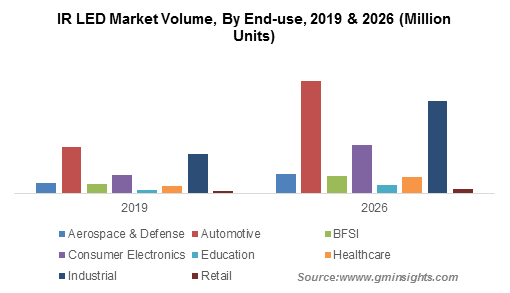 It is expected however, that the anticipated rise of the autonomous vehicle market in the region would be fueling reed sensor market growth as well. Furthermore, with major domestic companies unveiling new products and expanding their respective distribution networks to improve their capabilities of quenching the growing demands of reed sensors across various key application sectors, the North America reed sensor market has positioned itself on a lucrative path towards future growth. Attributing to the extensive regional growth, the revenue graph of the reed sensor market is projected to etch out an exponential growth trajectory in the years ahead. According to a report by Global Market Insights, Inc., the global reed sensor market is anticipated to surpass $2 billion by 2024. This entry was posted in Electronics and Media and tagged Automotive, Construction & Security, Consumer Electronics, Contact Position, Healthcare, Industrial Controls & Automation, Reed Sensor Market, Reed Sensor Market Share, Reed Sensor Market Size, Telecommunications. With the tremendous growth in the industrial, retail, and e-commerce sectors, inventory management software market has gained massive impetus over the past years. Quite undeniably, managing and tracking inventory has become an essential part of conducting business and inventory management software in this regard are efficiently solving the challenges related to vendors, inventory, orders, sale, stocks-outs and much more. This has significantly led to rapid adoption of these software programs, in turn driving inventory management software market growth which was pegged at USD 2 billion in 2017. The vast expanse of omnichannel retailing and increasing penetration of smartphones have also been identified as the inherent factors impacting the revenue graph of the global inventory management software industry. If reports are to be believed, given the increasing rate of paperwork errors, supplier fraud, employee theft, and shoplifting activities SMEs, SMBs, and the retail sector are the prominent end-use segments that are rapidly adopting inventory management software systems. These activities have also been deemed as the major sources of inventory shrinkage and are therefore favoring effective implementation of IMS programs in the retail sector, which is expected to dominate the overall inventory management software industry by accounting for a 40% share over 2018-2024. It is important to mention that according to the National Retail Federation’s NRSS (National Retail Security Survey) on retail theft, the retailers globally incurred inventory shrinkage losses of over USD 49 billion in 2016. Driven by these subsequent threats leading to inefficient inventory management, the demand for robust inventory management software for optimization is expected to increase consistently in the ensuing years. In fact, as per estimates, the global inventory management software market from inventory optimization application is expected to grow at a lucrative rate of 9% over 2018-2024. The contribution of the industry participants in developing optimal inventory management systems is vast and these players are constantly looking for adopting new technologies that can improve the overall productivity. Recently for instance, HighJump, a global provider of supply chain solutions and renowned inventory management software market player has introduced HighJump Warehouse Control System integrated with the HighJump Warehouse Management System. This inventory management solution provides supply chain professionals with a comprehensive suite that can fully capitalize on the automated and connected warehouse operations the modern-day chain professionals are adapting to handle shorter delivery windows, e-commerce, and enhanced consumer expectations. With such globally reputed players working toward introducing more technologically upgraded and value added solutions, inventory management software industry share is expected to nothing but proliferate in the ensuing years. Further endowed with the integration of recent technologies such as automation, big data analytics, RFID, cloud, Artificial Intelligence, and IoT this business sphere has become a lucrative hub for investments. Leveraging these technologies for more insightful solutions in inventory management, several industry participants are providing real-time analytics solutions and improved connectivity to supply chain and inventory management professionals. For instance, using connected networks such as computers, sensors, and smartphones, IoT can transfer the product information with the help of RFID tags/barcodes and transmit the data to the cloud-based inventory management software. Such technological integration techniques are typically used by the large-scale organizations that move thousands of orders daily. 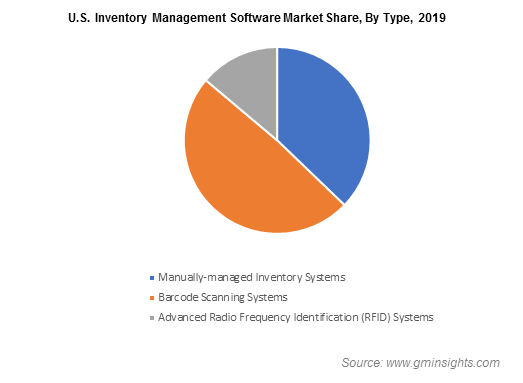 Reports state that the barcode scanning system held more than one half of the inventory management software market share in 2017, while the RFID segment is projected to register an impressive CAGR of over 11% over 2018-2024. Quite undeniably, these technologies have empowered the small and large-scale enterprises to grow and streamline their business models by harnessing the power of the advanced inventory solutions, in turn propelling the global inventory management software industry outlook. Lastly, it wouldn’t be wrong to say that along with shrinking workforce and increasing rate of stressed logistics systems, inventory management software programs will witness massive adoption in the ensuing years. A presumption shedding light on the same is of Global Market Insights, Inc., that forecasts the overall inventory management software market share to register a CAGR of 6% over 2018-2024. This entry was posted in Sustainable & Smart Technologies and tagged Advanced Radio Frequency System, Asset Tracking, Automotive, Barcode Scanning System, Cloud, Healthcare, Inventory Management Software Industry, Inventory Management Software Market, Inventory Management Software Market Size, Inventory Optimization, Large Organization, Manually Managed Inventory System, Manufacturing, Medical, Oil & Gas, On-Premise, Order Management, Product Differentiation, Retail, RFID, Service Management, SMB. Driven by the rapidly surging deployment of IR LEDs across a plethora of application verticals, the global infrared (IR) LED market has emerged one of the most transformative business spheres over the last few years. Companies forming a part of the automotive, consumer electronics, medical equipment, and myriad other industrial sectors are increasingly using IR assisted products. The use of IR LED helps to maintain working stability, accuracy, improve security, and reliability. The emerging technology trends such as automated driving assistance system, IoT, augmented reality, and artificial intelligence have also had a positive influence on the product demand. In most of the countries, in order to control the chances of accidents, automakers have been developing connected cars in which IR LEDs have been used prominently. It is thus rather overt that the advent of technically advanced features in every end-use sector will stimulate the infrared (IR) LED industry share. In line with the surging use of sensors in the various products, equipment, and vehicular systems, giants in infrared LED market have been investing in the enhancement of their product ranges. In the last few years, the automotive industry has witnessed a remarkable transformation with the advent of electric vehicles, connected cars, and self-driving cars. In addition, the growing concern among the automakers about the safety of occupants and the driver has encouraged them to bring new sensor assisted technologies such as excellent night vision, parking assistance, and blind spot detection. One of the renowned German automakers, Mercedes has implemented the Night View Assist system in its newly launched vehicle models that have full-LED headlamps incorporated with anti-dazzle infrared technology. The deployment of such IR LED technologies helps drivers bypass animals and pedestrians at night. In addition, the company has also deployed a thermal imaging and IR camera which could enhance the chances of spotting the objects ahead of the vehicle effectively. The use of IR technologies and innovative features in the recently developed automobiles for improving the safety, driving efficacy, and comfort is poised to propel infrared LED industry share. For the record, in 2017, the automotive sector accounted for 30% share of the infrared LED industry. Speaking more about innovations, it is prudent to mention that in order to gain competitive benefits, many companies are striving to launch new products in the automotive industry that could have a significant influence on IR LED industry outlook. For instance, recently, in January 2018, the Taiwan based company, Innolux Corporation has launched the first active matrix (AM) based Mini LED technology that has been used in automotive backlight panels. In addition, they are planning to develop a free shaped LCD for improving the appearance and design of future concept vehicles. With the deployment of next-generation technologies such as IoT, AR, and AI, consumer electronics sector has emerged as one of the revenue generating business areas lately. In this regard, the giants in the infrared LED market have already increased their focus on research and development activities. Currently the leading smartphone makers and security system providers are innovating a new range of sensor technologies for deploying the same in smartphones and security cameras. As on today, for attracting more customers, smartphone makers are adopting new product designs like the multiple camera setup where they are extensively using sensors and LEDs. Recently, Nokia has unveiled its plan to develop a new smartphone having five rear cameras that could be incorporated with IR focusing apparatus, five lenses, and LED flash. In another instance, a multinational lighting manufacturer, Osram is planning to invest 1 billion euros to expand an LED chip factory across Malaysia, the products of which will be used in phones, laptops, drones, fitness watches, security cameras, and automobiles. Moreover, Osram has been continuously involved in the invention of infrared LED chip for optimizing the effectiveness of security cameras. The Increasing requirement of CCTV cameras across the Asia Pacific region will further generate lucrative opportunities for the players in the infrared LED industry. The extensive deployment of technology across the automotive and consumer electronics industries will have a favorable influence on the infrared LED market. The involvement of many industries in digitalization for improving work efficiency, product performance, and consumer comfort also will fuel the product demand over the years ahead. In line with the shifting trends toward digitalization, infrared (IR) LED market will generate a revenue of more than USD 1 billion by the end of 2024. This entry was posted in Electronics and Media and tagged Aerospace & Defense, Automotive, BFSI, Biometrics, Consumer Electronics, Education, Healthcare, Imaging, Industrial, Infrared LED Market, Infrared LED Market Size, IR LED Market, IR LED Market Share, Lighting, Remote Sensing, Retail, Spectral Range, Surveillance. Rising demand for strong and durable plastic products across a slew of industry verticals has helped augment rotomoulding powder market, given that the rotomoulding process enables the production of efficient and high stress-bearing products. Rotationally, molded parts can be manufactured from different materials, can be multilayered and the process facilitates the production of standard or even custom designed parts. As compared to other plastic molding techniques, rotomoulding is less labor-intensive and the equipment can be configured for complex shapes, offering design flexibility, enhancing the rotomoulding powder industry scope. Manufacturing light, strong, corrosion resistant and durable components, whether big or small, is achievable through rotomoulding. Thus, the need for weight reduction in automobile, construction and material handling applications will boost the rotomoulding powder market consumption in the years ahead. A wide variety or containers are available in the market for shipping and material handling, such as shipment containers, barrels and drums, refrigerated boxes and bulk containers, combined bins and military containers. The rotomoulding powder industry has gained massive remuneration owing to a large demand for small and heavy industry material handling containers worldwide. Rotomoulded crates and eskies are considered ideal for transporting vegetables, fruits, liquids and chemicals since most of such products are made from food-grade plastic. As they are long-lasting and do not deteriorate like wood or get corroded like metals, these containers can prove to be a good investment due to their utility in fulfilling innumerable material handling needs, promulgating the rotomoulding powder market. Many businesses opt for rotomoulded containers for transporting goods because their one-piece design offers a higher capacity for load-bearing and guarantees durability. It is a well-known fact that global economic growth and the purchasing power of citizens immensely affect the material handling activities, as material handling orders are dependent on the demand for goods. The International Monetary Fund (IMF) in January 2018 had forecast that the global growth rate from 2018 to 2019 would be a strong 3.9%, indicating a positive industrial environment and the augmented need for material handling. The rotomoulding powder industry has additionally capitalized on a large number of small scale enterprises preferring rotomoulded containers and tanks for their low maintenance properties. Another promising source of revenue for the rotomoulding powder market could be the increasing number of recycling activities which require appropriate containers for sorting and handling waste materials. To elaborate, environmental concerns and government initiatives have emphasized the need for waste management and have led to the establishment of numerous waste recycling and metal scrapping facilities across the globe. For catering to these requirements, manufacturers have been providing customized rotomoulded containers and bins to the waste management services or recycling plants, where different kinds of materials are handled every day, even chemically reactive ones. The Asia-Pacific (APAC) region comprises of several emerging economies where recycling initiatives are intensifying and thus presents a great opportunity for the rotomoulding powder market. Recently, it was revealed that just 8 countries in APAC are responsible for 63% of the total plastic waste flowing into the oceans. Add to it, the mounting surplus of electronic and metal scrap has escalated the waste recycling industry in the region, in turn highlighting the material handling requirements. 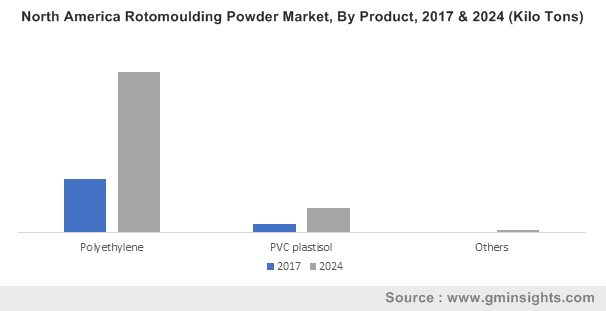 The APAC region subsequently contributed nearly 25% to the overall rotomoulding powder market in 2017, with the increased demand for containers as well as other rotomoulded plastic products like tanks, porta-loos, components used in construction and automobile parts. Lightweight parts help to reduce the gross vehicle weight and improve fuel efficiency, leading to the deployment of rotomoulded automobile components such as fuel tanks, dashboards, instrument panels and wheel arches. Reportedly, in 2017 more than 37.1 million passenger cars were produced by just three countries combined, namely China, India and Japan. With surging population, pollution concerns and the economic uplift across most of the APAC countries, the rising investments made to expand manufacturing capacities by automakers will propel the rotomoulding powder market. All in all, the low cost, eco-friendly production of rotomoulded containers or parts with minimum material wastage and least design constraints have prompted the material handling and automobile manufacturing segments to adopt these products. The industry growth is further aided by the efforts of rotomoulding powder market players such as BASF, Reliance Industries, ExxonMobil, Dow Chemical Company, GreenAge Industries, Pacific Poly Plast and Eco-polymers. This entry was posted in Bulk & Specialty Chemicals and tagged Automotive, Construction, Containers, Global Rotomoulding Powder Market, high density polyethylene, Leisure, Linear Low-Density Polyethylene, low density polyethylene, Material Handling, Medium-Density Polyethylene, polyethylene, PVC Plastisol, Rotomoulding Powder Market, Rotomoulding Powder Market Report, Rotomoulding Powder Market Research, Rotomoulding Powder Market Size, Tanks, Toys. 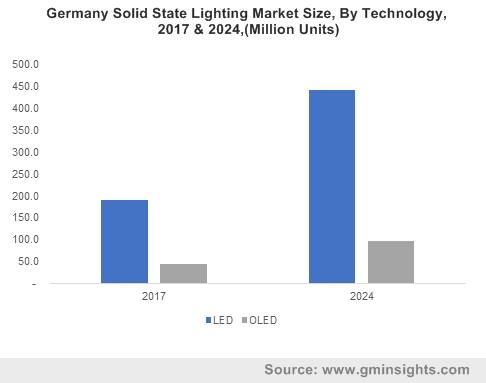 Owing to the global drift toward energy efficiency and improved energy consumption practices, the solid state lighting market has emerged as one of the most profitable niche verticals of the sustainable and smart technologies industry. Solid state lighting (SSL) technology is ten times more efficient than incandescent lighting and twice as efficient as fluorescent lighting. Moreover, the SSL technology has witnessed drastic enhancements in the recent times which has resulted in the SSL-based lighting sources such as LED and OLED become a vital component in the affordable high-performance buildings. Additionally, the increasing usage of SSL technology in automotive sector has impelled the solid state lighting industry share. The solid state lighting has been increasingly described as a high-potential technology which is currently in its nascent stage and is yet to reach its fullest potential. Despite rapid enhancements in semiconductor materials and smart control systems, the application benefits and the possibility of this technology lowering energy costs substantially is yet to be extensively researched upon. Taking concrete steps in this direction, the U.S. Department of Energy (DOE) announced a research fund to the tune of USD 15 million in April 2018 to accelerate further breakthroughs in solid state technology across the nation. The funding apparently intends to support innovative research by technology leaders in four prominent areas viz., advanced fabrication R&D, core technology research for LEDs, OLEDs, and Cross-Cutting lighting, novel lighting in a limited Mock Field Application, and proof-of-concept and prototype development for LEDs and OLEDs. In this context, it is quite imperative to mention that the research grant by DOE is in line with the strategic goals set by the Office of Energy Efficiency and Renewable Energy (EERE) to achieve higher energy-efficiency in residential and industrial sectors of the U.S. Needless to mention, the unveiling of such encouraging research initiatives by government bodies is certain to impel the growth prospects of solid state lighting industry in the forthcoming years. The rising deployment of LEDs in cities, combined with new smart technologies, has been instrumental in creating new opportunities for urban lighting professionals. In addition to this, numerous countries have mandated various policies and laws regarding the implementation of import tariffs for LED components and product utility that is bound to propel LED-based solid state lighting market. As per reliable estimates, the global LED-based solid state lighting industry is slated to garner more than USD 80 billion in revenue by 2024. Speaking of the regional growth potential, European nations are likely to be one of the most profitable terrains for solid state lighting market in the upcoming years. A favorable regulatory structure coupled with a robust support for new research to effectively implement smart urban lighting systems has caused rapid product penetration across European Union. With an aim to develop advanced tools that would provide cities with a range of competencies in dealing with complex procurement procedures, the European Union had rolled out a project named as FP7 SSL-erate. The project further intends to fast-track the uptake of high-quality SSL technology across the continent by bringing validated information to relevant stakeholders and encouraging open innovation programs. Europe solid state lighting market, as per Global Market Insights, Inc. holds a revenue target of USD 20 billion by 2024. Elaborating further, the project explored the advantages that smart human-centric lighting can have for urban dwellers and how these systems can align with the goals of a city to become more sustainable in the long run. Needless to mention, the implementation of such pioneering initiatives would have an optimistic influence on the Europe solid state lighting industry share. Owing to enhanced levels of performance compared to traditional lighting products along with lower cost of ownership, the solid state lighting market has been garnering commendable popularity across sustainable and smart technologies industry in the recent years. With the involvement of multiple stakeholders including national laboratories, academic institutions, and industry researchers who would pour in their expertise in improving the technology, the solid state lighting market is bound to proliferate at an impressive pace in the times to come. In fact, according to a research study compiled by Global Market Insights, Inc., the commercialization potential of solid state lighting industry is estimated to exceed USD 85 billion by 2024. This entry was posted in Sustainable & Smart Technologies and tagged Automotive, Commercial, Indoor, Industrial, Lamps, LED, Luminaires, New, OLED, Outdoor, Residential, Retrofit, Solid State Lighting Market, Solid State Lighting Market Forecast, Solid State Lighting Market Growth, Solid State Lighting Market Research, Solid State Lighting Market Size. Encompassing a widespread application spectrum including construction, electronics, and automotive sectors, advanced glass market size has been witnessing an extensive upsurge in recent years. Advanced glass is essentially normal glass that has been reinforced to suit the needs of a certain type of application or to simply be more resistant to external forces. The demand for this type of glass has been increasing exponentially on account of its aesthetic appeal, pushing advanced glass market growth. In 2016 alone, this business space was worth more than $60 billion. 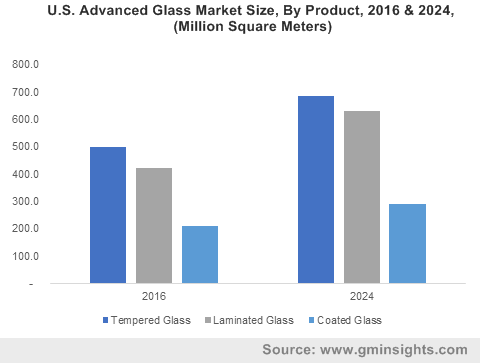 Endowed with a favorable product portfolio, advanced glass market is projected to witness remarkably profitable growth over 2017-2024, with a target valuation of 10.5 billion square meters of consumption by 2024. Tempered glass is one of the most prominently used types of advanced glass, widely recognized for its high temperature resistance and strength. Driven by its favorable properties, it is increasingly used in the automotive and construction sectors, thus stimulating tempered advanced glass market. Tempered glass in fact, has emerged to become one of the most preferred forms of glass to be used in windshields, thus enabling advanced glass industry to have found a profitable growth avenue in the automotive domain, which is growing at a remarkably fast-paced growth rate lately. Tempered glass not only has a high strength threshold but also when commendable shatter resistance – that is to say, unlike regular glass, it does not break into long sharp shards but rather disintegrates into small granular pieces which are almost harmless. Naturally, the material is widely used in the construction sector, as buildings require highly resilient glass that can withstand periodic contractions and expansions. Undeniably, tempered advanced glass market has found a viable end-use avenue in the construction sector. Tempered glass also finds uses in various household items like furniture, cookware, microwaves, refrigerators, and washing machines, further expanding its application scope. Laminated glass comprises structural polymer interlayers, which is a pivotal factor that aids this material to maintain its structure even after breaking, on the grounds of which it has found increased applications in the construction of railings, skylights, and floors. The rising demand for laminated glass on account of its capability to block 99.9% of UV rays has also stimulated advanced glass industry. Laminated advanced glass industry size is estimated to surpass $45 billion by 2024 – a valuation forecast that may have a tremendous impact on the overall market share. Coated glass, in recent years, has emerged to be significant contributor toward the growth of advanced glass industry, pertaining to its rising demand on the grounds of its special reflective coatings and increased conductivity. Apparently, the coating on glass is made to act like a mirror for long-wave infrared radiation that limits the absorption of infrared radiation in buildings. The coatings also have low emissivity which increases the energy efficiency of buildings. It is estimated that low emissivity coated advanced glass industry will witness a 6.5% CAGR between 2017-2024. Despite the introduction of humongous numbers of raw material, glass still stands as one of the most pivotal elements on account of its aesthetic beauty and its transparency. With the product finding increased applications in the construction and automotive industries, advanced glass market size is certain to witness a massive upsurge. As the application scope for glass increases further in the ensuing years, advanced glass industry is projected to experience an exponential growth rate, with a target revenue estimation of more than $110 billion by 2024. This entry was posted in Polymers and Advanced Materials and tagged Advanced Glass Industry, Advanced Glass Industry Analysis, Advanced Glass Market, Advanced Glass Market Application, Advanced Glass Market forecast, Advanced Glass Market growth, Advanced Glass Market outlook, Advanced Glass Market PDF, Advanced Glass Market share, Advanced Glass Market size, Advanced Glass Market trends, Automotive, Coated Glass Market, Construction, Flat Glass Market, Infrastructure Glass Demand, Laminated Glass Market, Tempered glass market. Sulfone polymers market size has been forecast to be fueled by the product’s diverse utilization range in various end-use domains, mainly because of the combination of its characteristics that make it highly heat resistant, mechanically tough, resilient to hydrolysis and transparent in high temperatures. Sulfone polymers find widespread usage across the automotive and aerospace industries, that require the application of thermally stable and light weight but tough plastic components. The growth of sulfone polymers industry can also be attributed to the product’s demand from the medical sector, owing to the fact that various polymers including polysulfone (PSU) and polyphenylsulphone (PPSU) have found varied usage in healthcare. It is noteworthy to mention that polyethersulfone (PESU) has contributed greatly to the growth of the sulfone polymers market in the pharmaceutical and biotechnology sectors, as it is a basic ingredient for filtration membranes. The aerospace and automotive sectors, in recent times, have been moving away from using metals and leaning towards using engineering plastics to reduce weight and increase the fuel efficiency of aircrafts and vehicles. Sulfone polymers are widely used in these industries to manufacture vehicle and aircraft components that are highly creep resistant, register low mold shrinkage and remain stable at high temperatures. Automotive industry has a considerably huge share in the sulfone polymers market registering a CAGR close to 6% over 2017-2024. The application of sulfone polymers in aerospace industry has also been on a rise, as the demand for light but highly heat resistant material used to manufacture aircraft radomes, connectors and terminal blocks has been increasing lately. In consequence, this would have a commendable impact on sulfone polymers market share from the aerospace sector. The field of medicine has been revolutionized by the use of engineering plastics, making patients’ lives safer and bringing about a dynamic change in the development of innovative medical devices, which in the years ahead, will commendably influence sulfone polymers industry share. In terms of volume, the medical field has made rather appreciable contributions toward the growth of sulfone polymers market, as plastics made of sulfone polymer have helped reduce medical costs, simplified pain management and prevented infections. Among various sulfone polymers, polyethersulfone (PESU) has been forecast to register the fastest growth in sulfone polymers industry, given its numerous applications across myriad verticals. Polyethersulfone has gained popularity in sulfone polymers market for its specific features such as light weight, low smoke emission and high impact resistance. When reinforced with glass fiber, it creates a composite that exhibits high tensile elasticity and strength, while otherwise, the product is also used to manufacture filtration membranes that can be used to remove salmonella, mycoplasma and mammalian cells from liquids. Its widespread application spectrum has thus led analysts to forecast that polyethersulfone-based sulfone polymers industry share will register a CAGR of 6% over 2017-2024. Sulfone polymers have proven to be the most apt choice for the manufacturing of filtration membranes as they have excellent biocompatibility, outstanding hydrolytic stability and impressive mechanical properties. The deployment of sulfone membranes has found widespread usage in food processing, water treatment and gas separation as well, providing sulfone polymers industry with the much-needed stimulus. 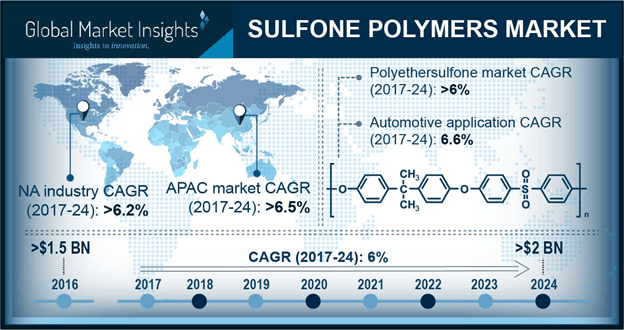 Asia Pacific has been projected to witness the fastest growth in sulfone polymers market over the forthcoming seven years, driven by the growing automotive and aerospace industries in the emerging economies of China and India. The multibillion-dollar sulfone polymers market firm, Solvay has recently invested heavily in India to expand its plant capacity at Panoli. Solvay alone has projected the increase of its global sulfone polymer production by 35% in the next 5 years, with significant investments in Asia and USA. Speaking of which, North America accounts for a major share in the production of leading medical instruments and automobiles. Driven by the demand for high performance engineering plastic in these industries, North America sulfone polymers market will witness a CAGR of 6.2% over 2017-2024. Sulfone polymers market has taken a hit in the food and medical industry, as these products are derived from a combination of Bisphenol A (BPA) and disphenol. Scientific studies have shown that consumption of BPA has been deemed harmful to human lives and the environment. Therefore, some countries around the world have banned the use of polycarbonates in baby bottles. However, the FDA, CDC and WHO have all confirmed that low levels of BPA contamination is inconsequential to the human body, which may contribute toward eliminating some of the restraints in sulfone polymers market. The concern about BPA may affect consumer opinion about the presence of sulfone polymers in food containers and can liners. However, sulfone polymers market as an entity will remain unaffected and will continue to grow despite government regulations, as chemically stable and light weight engineering plastics obtained from sulfone polymers have been used to great advantage in the aerospace, medical, biotechnical and automotive industries. This entry was posted in Polymers and Advanced Materials and tagged Aerospace, Automotive, Electrical & Electronics, Medical, Polyethersulfone, Polyphenylsulfone, Polysulfone, Sulfone polymers industry, Sulfone polymers market, Sulfone polymers market analysis, Sulfone polymers market forecast, Sulfone polymers market growth, Sulfone polymers market outlook, Sulfone polymers market pdf, Sulfone polymers market share, Sulfone polymers market size, Sulfone polymers market trends.